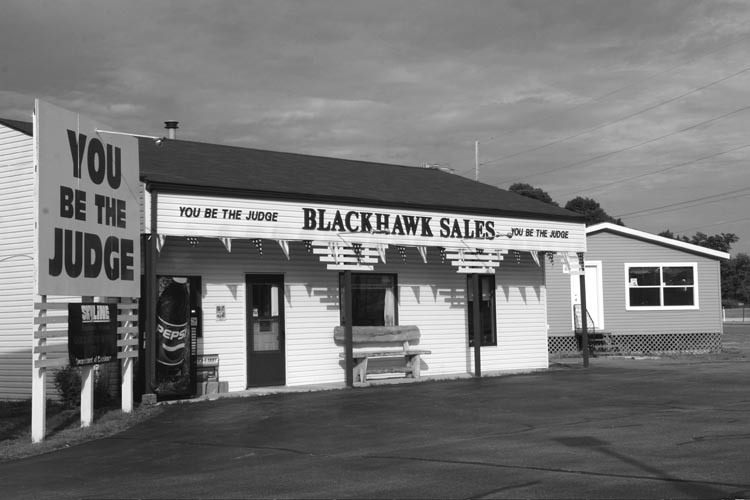 Re-collecting Black Hawk is a book-length, image-text essay exploring the cultural and political landscapes of the Midwest. 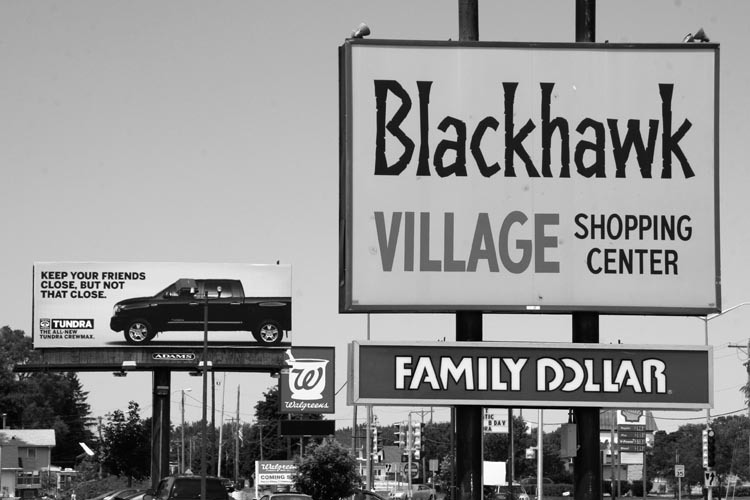 It brings together roughly one hundred seventy photographs of historical markers and monuments, organizations, sports teams, consumer products, businesses, parks, subdivisions and other places that reference the 19th century Sauk leader Makataimeshekiakiak, more commonly known as Black Hawk. These photographs are arranged geographically and organized into chapters by state (Iowa, Illinois, and Wisconsin). Each image is paired with an appropriated text drawn from sources as wide ranging as press releases and scholarly histories, government reports and advertisements, and poetry and recipes published in tribal newspapers. Interwoven throughout are contributions by and interviews with activists, scholars, and tribal officials, who, in some cases, reflect on the image-text strategy and, in other cases, ground it in specific, current struggles around decolonization, self-determination, and cultural revitalization. 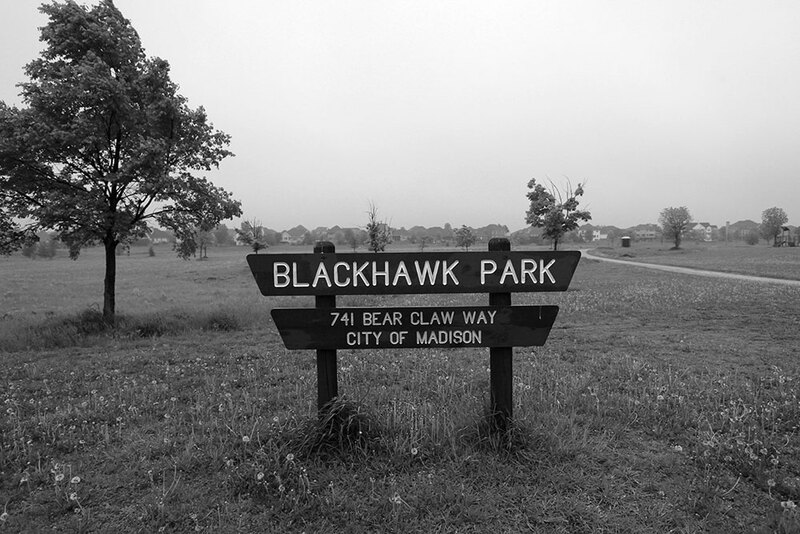 Re-Collecting Black Hawk is both a call and an attempt to practice landscape differently. It proceeds by staging a series of encounters between image and text, each with different implications in the realm of political imagination. The book’s title suggests holds a double meaning. In the most literal sense, it connotes the remembering of something past. The hyphen, however, hints at another, more active meaning. To re-collect is to gather again or to collect anew in the present. Or, following Bruno Latour, to re-collect is to reassemble Black Hawk to account the disconnect between past and present, absence and presence. Released May 2015 by Pittsburgh University Press. See book website for excerpts and more information. The following are sample image-texts similar to those that will appear in the book. Blackbird Bend is a thumb of land along the Missouri River. Only God knows who owns it; then again, maybe not. If the land could speak, what would it say? That once it was inhabited by the Omaha Indians. Then the Missouri changed course and land that had been west of the river ended up on the eastern bank, several thousand acres gone from the Indians’ Nebraska reservation. Sometime early in the twentieth century it came into the hands of white owners in Iowa. Tiring of white ownership, however, the Indians decided to reclaim the land in 1973. About twenty of them trudged to Blackbird Bend in sneakers and blue jeans at about the time the Lakota, not too far away, were winding up their occupation of Wounded Knee. But no one remembers Blackbird Bend, except the Omaha Indians, of course. In 1975, the Indians occupied the land for a second time. Then the lawsuits began, a decade and a half of court appearances, motions, briefs, trial, and appeal. And still the most difficult question you can ask anyone along this brief stretch of Missouri Valley is only four words long: Who owns Blackbird Bend? In 1767, a great Sauk leader known as “Black Sparrow Hawk” was born. Strong beliefs, independent thinking and an unwavering commitment to his family and his people earned him a reputation as a man of integrity and courage. In 1832, along with 1,200 of his people, Black Hawk was driven from his ancestral home during a war that bears his name. We celebrate this Sauk leader and his courage with our Chief BlackHawk Porter, the kind of beer that makes you say Ma-ka-tai-she-kia-kiak! For hundreds of years, American buffalo, also known as bison, roamed free across the interior of North America. Used for clothing, food, shelter and tools, bison held great meaning for many different American Indian peoples. But in the 19th century, encouraged by the federal government, white hunters devastated the bison population as part of a strategy to overcome western tribal nations. Mighty herds of bison that numbered in the tens of millions were reduced to only a few hundred, seemingly destining the bison to extinction. But the Ho-Chunk Nation, along with more than 40 other tribes across the country, is working to reestablish healthy bison populations on tribal lands. And in the process, the Ho-Chunk hope to improve the healthy and diet of their tribal members by reconnecting with the diet of their ancestors. Because of the high rates of diabetes and heart disease among tribal members, and because of the reported benefits of bison meat, tribal leaders decided to develop a bison herd on their Muscoda property. They joined the InterTribal Bison Cooperative, a nonprofit based in Rapid City, South Dakota that helps to coordinate and assist tribes in the reestablishment of bison herds. The Ho-Chunk Nation acquired their first four bison—one male and three females—from Yellowstone National Park. Life expectancy for Native Americans (65 years) is shorter than that of all other U.S. Non-Natives (73.3 years). The highest mortality rate is for people between the ages of 50 – 65. This means that the average Native American barely lives long enough to reach the age of eligibility for most age-related programs. In addition, evidence indicates that Native Americans experience the same limitations in their daily living at age 45 as do non-Native American people at age 65. Because of this, many Native elders would benefit from receiving earlier preventative care, screenings and early intervention treatment. Native American tradition generally considers a person an elder at age 55. Chief Illiniwek has not yet left the campus. Months after the University of Illinois decided to retire the mascot officially, banning him from university activities, the image of Chief Illiniwek, a buckskin-clad American Indian, was allowed to return to an event during homecoming celebrations this weekend on the Urbana-Champaign campus. His likeness appeared on the side of a couple of floats, face-forward, fully framed in feathers. In the name of free speech and in a reversal of policy, Chancellor Richard Herman lifted a prohibition on the use of the Chief Illiniwek logo on homecoming parade floats just a day before the parade rolled on Friday night. 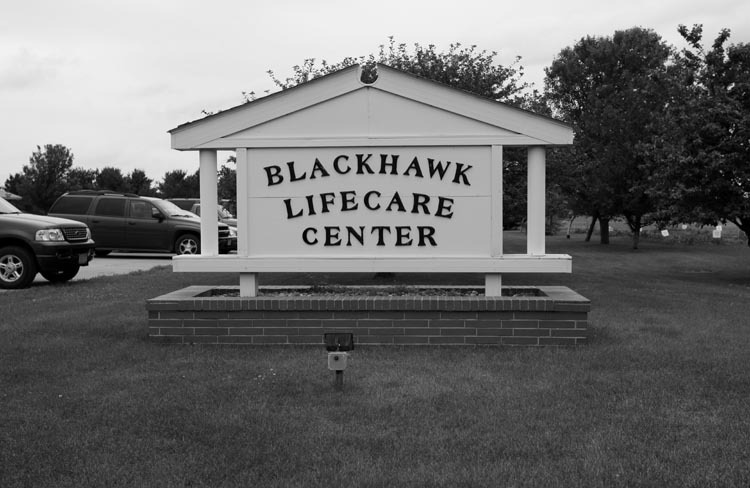 Just what remains of the Black Hawk War today? 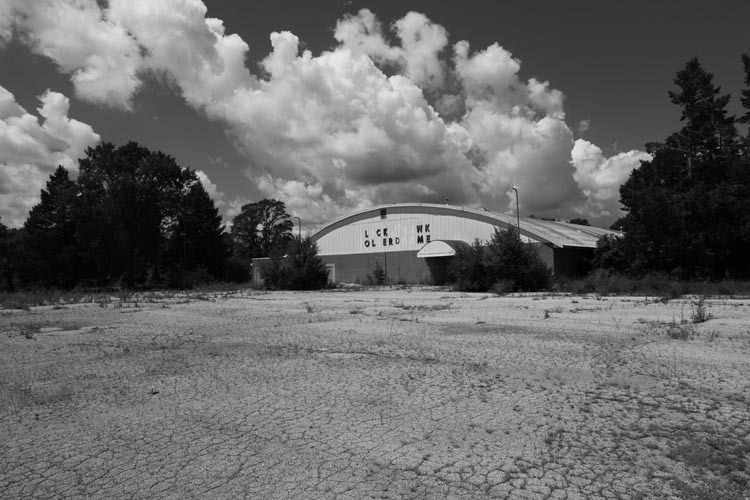 What can the history buff or curious sightseer of the 1980s find along the 600-mile trail? Simply answered, plenty. 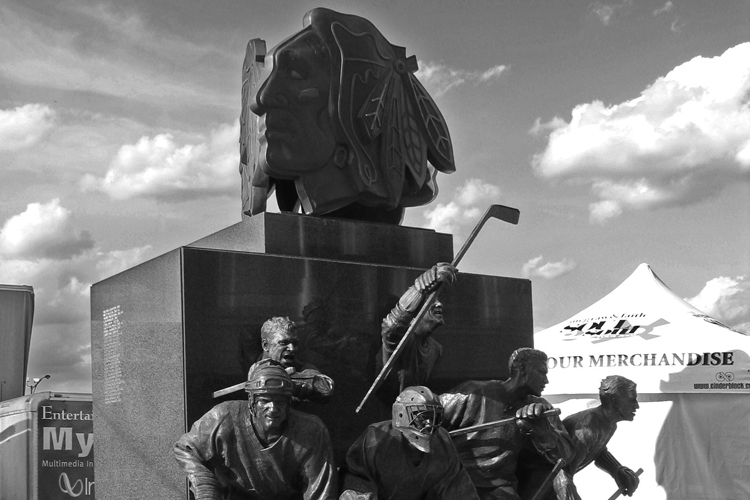 The words “Black Hawk” are familiar to many – they are used in the names of an NHL hockey team, of a number of hotels, of a dozen schools, of a handful of businesses. But few people are aware of the emotions that underlie these words, for the story of the original Black Hawk is a tragic one. The person who has the time and inclination to share these emotions could begin near what is now Rock Island, Illinois. One hundred fifty years ago much of the area where the war took place was lead-mining country, newly opened to settlement and very sparsely populated. Today, it is still largely rural. It is a beautiful and quaint piece of country, and it breathes the history of the Black Hawk War. 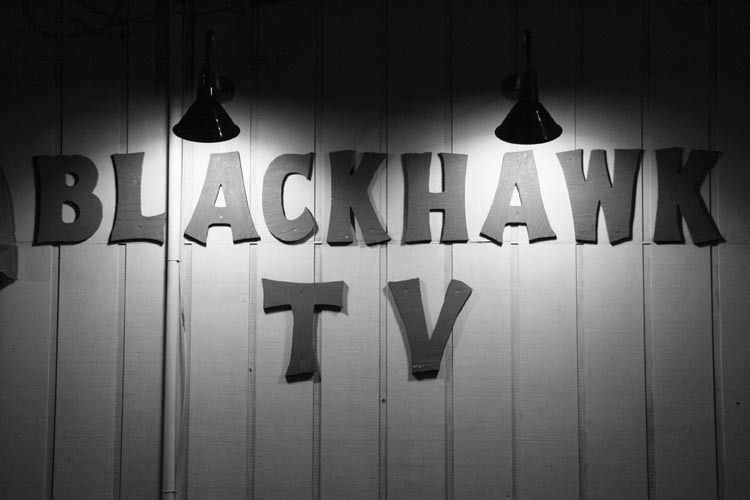 Nicholas Brown and Sarah Kanouse, Re-Collecting Black Hawk. Pittsburgh: University of Pittsburgh Press, 2015. All content is licensed under a Creative Commons Attribution-ShareAlike 3.0 Unported License.